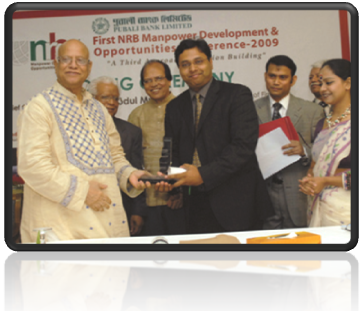 Mr. Abul Maal Abdul Muhith, Honorable Finance Minister of the Government of the People’s Republic of Bangladesh, hands over the award for the “Best Skill Development Institute” to Mr. Abdullah Al-Mamun, Managing Director, Greenland Training Centre Limited, at the First NRB Manpower Development & Opportunities, Conference 2009 held on 4 July 2009 at Dhaka Ruposhi Bangla Hotel. Engr. 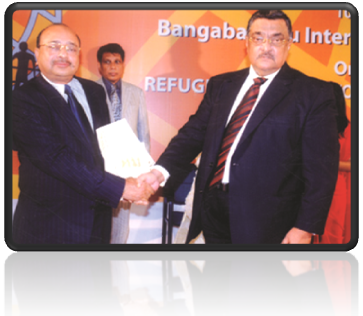 Khandker Mosharraf Hossain, Honorable Minister, Ministry of Labor Employment and Ministry of Expatriate Welfare and Overseas Employment of the Government hands over the award for the “Best Recruiting Agency” to Mr. Mohammad Abdul Hye, Chairman, Greenland Training Centre Limited at “Remittance Utshab & Shonar Manush Award” ceremony organized by RMMRU.